Part 5: Was Advanced Dungeons & Dragons a different game? By 1976, Dungeons & Dragons had reached beyond the audience of miniature gamers who stood a chance of understanding the inches, attack matrices, and Chainmail conventions spread across 7 little, brown books. Co-creator Gary Gygax saw his original rules limit D&D’s growth. He saw accessible imitators like Tunnels & Trolls and Warlock attract players. But D&D’s sketchy rules caused other problems. In Los Angeles in 1975, Lee Gold started Alarums & Excursions, a fanzine that collected articles and comments from D&D enthusiasts. 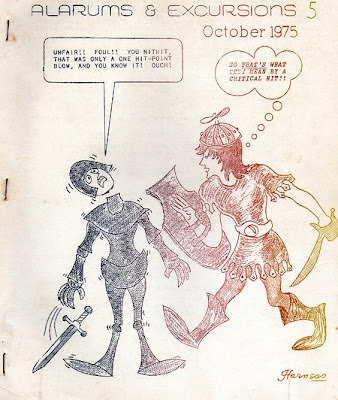 Her zine attracted contributions by Gary Gygax and influenced the entire role-playing hobby. When the D&D house rules used around Caltech diverged from the brown books, Gold ruled that experience awarded in these Warlock games would no longer apply to characters in other Los Angeles D&D games. Her ruling appears in A&E issue 5, from October 1975. In these days, players tended to take characters from one DM’s dungeon to another, much like today’s organized play brings players from one game table to another. The megadungeons of the era made dropping in for a delve easy—so long as the DMs ran similar games. But unlike today’s Adventurer’s League, the early games followed no campaign standards and shared no dungeons. Back then, every DM saw players bring outrageous characters from another dungeon. Even if DMs played by the book, they disagreed about Gygax’s intentions. Old school gamers still dispute how Elves were supposed to switch between acting as a magic user and a fighting man. And to fill areas of “non-direction,” players needed house rules. At best, house rules tended to get spread among players in a region, so nearby players might share rules for elves, morale, and negative hit points. These sorts of house rules turned into the Warlock rules and the Perrin Conventions. At conventions, D&D games continued the wargaming tradition of competitive tournaments. The party that achieved the most won. For example, Tomb of Horrors debuted in a competition held at Origins in 1975. The G, D, and A-series adventures all came from tournaments. The first tournaments drew judges from Gary Gygax’s friends and family, but soon similar D&D competitions appeared everywhere. In the December 1977 issue of Dragon, Gygax recalled making a plan. “Two years ago, we determined to revise the whole of D&D in order to clean up the errors and fill in the holes. The project is a long and complicated one, a task not accomplished overnight. Gygax realized his revision would take years—ultimately 3 years of work. But D&D needed help immediately. Help came from a man who had mixed D&D with the Warlock rules—a D&D “parody” that needled Gary Gygax. “As if by divine inspiration,” J. Eric Holmes contacted TSR and volunteered to revise the original rules into a beginners’ book. This entry was posted in Role-playing game history and tagged Advanced Dungeons & Dragons, Adventurers League, Alarums & Excursions, basic rules, Gary Gygax, house rules, J. Eric Holmes, Lee Gold, Perrin Conventions, Tim Kask, Tomb of Horrors, tournament module, Tunnels & Trolls, warlock. Bookmark the permalink.